Our Foundress, Rev. 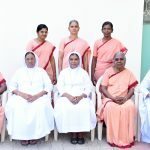 Mother Annammal was born in 1836 at Varaganeri, Palakarai, Tiruchirapalli, Tamil Nadu, India. In the later part of 19th century, owing to cholera, many young girls, including our foundress, lost their husbands and were treated worse than slaves by their families. The society didn’t permit them to remarry. Our Foundress heard the divine call to work for the welfare of the women especially the widows. She courageously went about begging for the sick and the needy, educating the little ones and praying with the cobblers. Inspired by her service, many young widows joined with her. As the number grew, she approached the Bishop Alexius Canoz S.J. to start a community for the widows. When permission was denied owing to financial difficulties, she assured him that she would not ask for any financial aid. Trusting in the providential care, Rev. 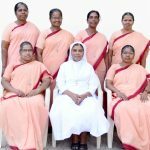 Mother Annammal founded the first community with nine widows on 2nd February 1858. Earned their daily bread by manually hulling the paddy.